With the increased awareness of the social, economic, and environmental facets of coffee production, sustainability initiatives, including certification, are becoming ever more significant. The widely recognisable marks that appear on coffee labels are great for the coffee industry as a whole as they help ensure that our soil stays in great condition, farmers are paid fairly for their work and that the lungs of the earth are protected. These systems have been put into place to help ensure that the corresponding organisations are as widely recognisable as possible. Every packet that includes any of these certifications must be submitted for review to the governing body it's associated with, this is to ensure that the label is the correct size shape and colour and not distorted in any way. If you would like to know more about the certification design rules or the organisations themselves click on the icons above or to the left of certification description. Each link will include the up-to-date vector images for designers’ use. 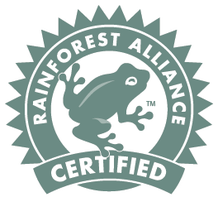 The Rainforest Alliance Certified™ seal means that farmers follow more sustainable agricultural practices that protect forests, rivers, soils and wildlife, while being good community neighbours. Rainforest Alliance certification also helps ensure workers have improved access to safe working conditions and decent living conditions, health care and education for their children. This logo on your packet of coffee means very few chemicals and pesticides were added at anytime during its production, Masteroast aim for as few as possible. The Soil association supports organic farming and recognize the direct connection between our health and how the food we eat is produced. This logo will usually be present next to the Soil Association logo shown above and states that the product has been independently certified by the European Union under their own regulatory framework. This improves and reinforces the EU organic farming standards both within the EU and all produce imported or exported. This is the clean process of decaffeinating coffee that is both good for your health and easy on the environment. Some processes can use damaging chemicals and they don't remove as much caffeine as they may suggest. The Swiss water process uses the pristine water of the the coastal mountains of British Colombia, Canada to gently decaffeinate the bean a process that can also guarantee 99.9% caffeine removal. This seal or wordmark is the definitive way to tell if your coffee has received the premium decaffeination process.